Life just can't stay peaceful forever. Never has been known a time when the Clans were completely at peace and harmony. Even the greatest story teller from the elder's den couldn't tell you a full story without tragedy. And now, the Clans are about to realize the greatest moment of crisis yet. At this rate, the Warrior code will be tossed aside, and even the oldest traditions are being threatened. Rebellions rise up. Clans split apart and come together. Down to the very individual, the true moral laws are being tested to their limits. Will the ways of the Clans all change forever under these starry nights? 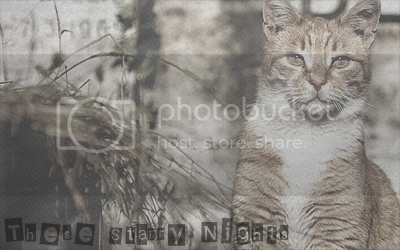 Welcome to ~These Starry Nights v.2~, where absolutely anything is possible. We have an extremely flexible and open plot, giving the possibilities no boundary except for your imagination. Anyone can start a rebellion, or make a difference! TSN v2 is an account-per-character Warrior Cats RP site that uses a unique, fun, simple stat system to aid roleplaying, without the need for moderators. As a semi-literate site, we have a word count minimum of 100 words, and accept role-players of any level, and encourage growth and development in your writing and literary skills!